The fire at Notre-Dame in Paris has led to pledges of funds to restore the cathedral by the Pinault family as well as Bernard Arnault. Image: Milliped via Commons Wikimedia. The family, one of the wealthiest in France, pledged the funds to "completely rebuild Notre-Dame". The donation was offered via the fashion group Kering which was founded by Francois Pinault and now controls well known brands including Gucci, Saint Laurent and Bottega Veneta. Shortly afterwards, fellow French billionaire Bernard Arnault, chairman of the LVMH luxury goods group who bought a majority stake in Phillips auction house in 1999 and reportedly also made a bid to buy Sotheby’s a year later, offered €200m for the reconstruction efforts. French President Emmanuel Macron said that Notre-Dame will be rebuilt and a national fund will be launched immediately. Paris Mayor Anne Hidalgo is planning an international conference to coordinate the donations for the restoration project, while regional authorities for the greater Paris region have said they would contribute €10m. 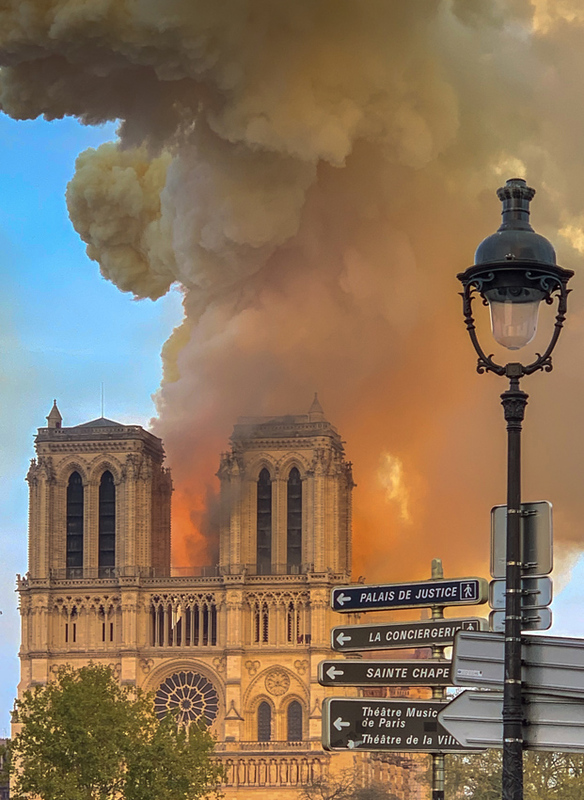 The fire at Notre-Dame broke out at around 6.30pm yesterday and was finally extinguished this morning. While the spire and roof collapsed, the Cathedral’s main Gothic stone structure survived including its two bell towers. Officials at the Paris prosecutor's office have said the cause of the fire is currently being investigated but that it could be linked to renovation works that were taking place. The spire that collapsed was not part of the original fabric of the Cathedral but, in fact, dated from the 1860s. The spire had undergone several changes over Notre-Dame’s 800-year history, including being dismantled during the French Revolution before later being reinstalled. It appears that the Cathedral's three famous rose windows that date back to the 13th century have survived, although it is believed that some of the other stained-glass windows may have perished. Other works of art and religious relics were saved as firefighters, police and other individuals formed a human chain to rescue the artefacts from the building’s interior. These include a crown of thorns said to be worn by Jesus before his crucifixion and tunic believed to have been worn by Louis IX when the crown of thorns was brought to Paris. Some of the larger paintings however were reported to have been too heavy to take down and may have been damaged. The United Nations' cultural agency UNESCO has said it will stand “at France's side” to restore Notre-Dame which was designated a world heritage site in 1991.